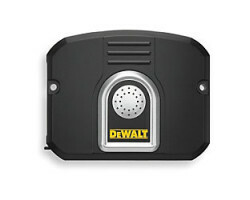 With DEWALT's MobileLock GPS Locator with Anti-Theft Alarm, securing your worksite and valuable equipment is easy. This durable, weatherproof security tool is simple to install by magnet or screw mounts and works indoors and out to track equipment via GPS locator technology and contact up to three people via cell phone or email with alarm notification in case of theft. This customizable alarm and locator can be set to detect motion, vibration and temperature change in addition to a tamper sensor that protects the alarm itself in case of tampering. This wireless anti-theft tool works with rechargeable lithium ion batteries that hold their charge for up to 30 days. 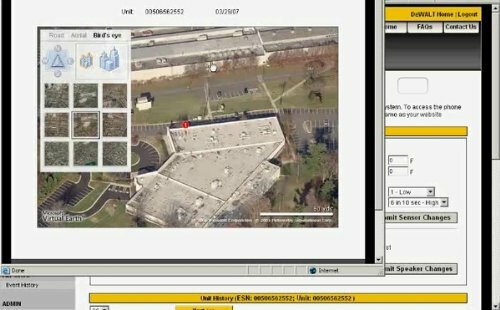 The GPS tracking technology is available online through the MobileLock website and allows users to visually locate the MobileLock unit on a map after logging in with a password. It’s hard to know where to begin with an anti-theft alarm and tracking system this sophisticated and user-friendly. 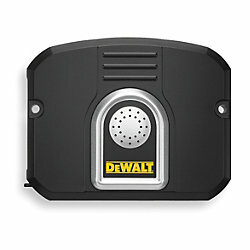 With anti-theft sensors that detect vibration, temperature, tampering, and door-contact, a tracking device that works indoors and out, a tracking service that lets you customize everything via the Web or phone, and an alarm system with siren and electronic phone/email alerts, there’s just no better way to protect machinery, trailers, vehicles, and more than with DeWalt’s MobileLock. The perfect security system for general contractors, home builders, remodelers, and landscapers, this portable, wireless locating and alarm system attaches to heavy machinery, tool trailers, vehicles, power tools, and more; making would-be thieves think again before trying to nab your stuff, and easy to follow if they take it anyway. Equipped with a state-of-the-art Global Positioning System (GPS), the MobileLock mounts to equipment, storage containers and other assets with either its integrated, heavy-duty magnet or with included screw fasteners. If an intruder tries to enter a secured area, disturb protected equipment, or remove the Mobilelock from what it’s attached to, the MobileLock alarm siren sounds, and alerts are sent via cellular technology to up to three different phone numbers or email addresses you select. Weatherproof, impact resistant, heat resistant, portable and wireless, the MobileLock works indoors and out; protecting valuable tools, vehicles and machinery, rain or shine, and tracking it all the way to and inside chop shops, thief-owned garages, or wherever the crooks try to house your stuff. The MobileLock runs off of rechargeable lithium ion batteries, staying armed for 30 days on a single charge (or, an extended runtime kit (DS505K) that boosts runtime up to 90 days is available separately) to protect appliances, garages, open rooms under construction, landscaping materials and equipment. Great for commercial construction sites, electrical, mechanical and HVAC professionals, the Mobilelock locator and alarm is a user-friendly, self-installed system that you can customize to fit specific applications and security needs. 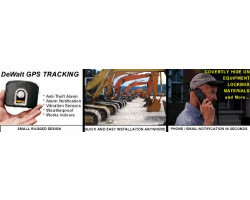 Sensor features and the GPS locator can be accessed via cell phone or through the Mobilelock Web site, where you can log on to customize settings and monitor equipment. 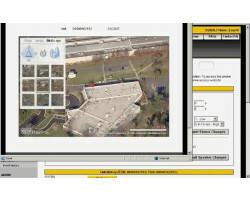 The system easily programs for personalized arm and disarm schedules, to change alert contacts (up to three via phone or e-mail), adjust siren settings, and report status information such as battery level and signal strength--whatever it takes to protect a wide variety of things, from heavy equipment, to office trailers, gang boxes to remote storage containers. The MobileLock is equipped with a tamper sensor that protects the alarm itself. A door-contact sensor detects when vehicle doors are opened or shut. A vibration sensor detects whether engines on heavy machinery are started, if the trailer is in tow, or if the contractor’s saw is being toted across the parking lot. There’s even a temperature sensor for optimal protection. (An indoor motion detector kit (DS510K) that triggers the alarm if movement is detected up to 50 feet away is available separately.) Each sensor programs individually via cell phone or the Mobilelock Web site to monitor the mobile asset. The Mobilelock cellular and location-based services utilize the Sprint Nationwide PCS Network. A one-year service plan at $19.95/month is required for first year. Once you've purchased your MobileLock, set up your service contract (see www.dewalt.com/us/security/mobilelock/rateplans.asp), and installed the unit, if the MobileLock-protected asset is disturbed, the alarm will sound and you'll receive a phone call or e-mail notifying you that there has been a security breach. You can log onto the MobileLock Web site, enter your personal pass code, and then access street maps or satellite imagery showing the approximate location of the MobileLock unit for quick recovery. Note: The GPS service plans are optional. There are no recurring charges incurred by purchasing the GPS hardware. Products purchased online or from an authorized retailer and under warranty qualify for an exchange with a valid receipt. Warranty service is handled entirely by Cattail Technologies. Extended Run time, DS505Using alkaline cells, the runtime is extended by 8 wks. Indoor Motion Detector, DS510Passive Infrared motion sensor for monitoring rooms for intrusion.